Scores of people clad in shorts, flip flops and “UP North” tee-shirt swarm the little café, hoping for a reprieve from the sweltering heat and burning sun. They’ve come from all over—from coast to coast, from other countries, and from just a few hours south, in Minnesota. The primary attraction is Leech Lake. Next, seems to be The Village Square. Owned and operated by generations of a local Walker family, this hot spot has been in business since 1979. 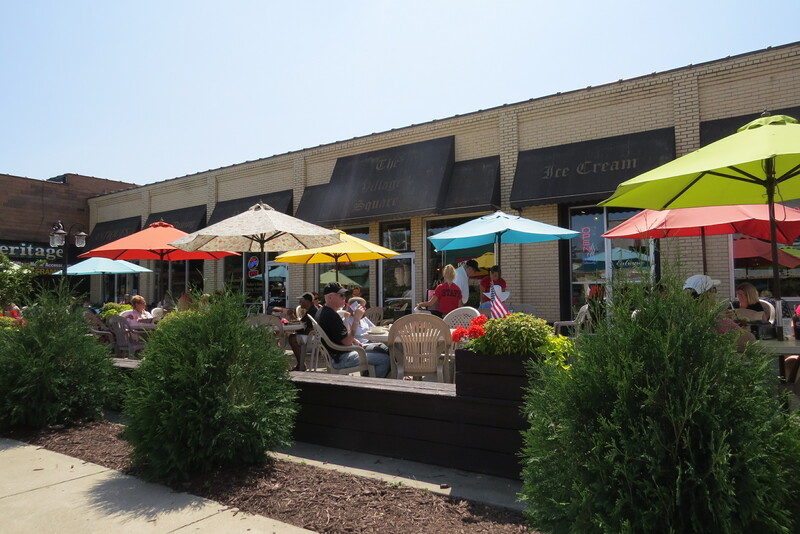 Yes, this little coffee shop and bistro is hopping with hungry, thirsty, vacationing customers. After my long bike ride into Walker, the idea of air conditioned cold seems a bit extreme, so I remain outside. I am fortunate enough to have secured a table with an umbrella before the overflow of indoor crowds burst out. Service is fast and friendly. My waitress brings me a pitcher of ice water, and gives me all sorts of ideas of where else to ride while I am in the area. What an impressive menu! From pizza to pasta, soups, salads, sandwiches, burgers, wraps and an array of apps, plus a full service bar, full service coffee shop, AND an amazing ice cream counter! On top of all that, they host live music, cater events and offer carry out. As I pour over the many food choices, I am thinking, “yes, I will be frequenting this place”. My waitress returns to take my order, and I anxiously await delivery of my much anticipated meal. The Greek Chicken Wrap is simply delicious. 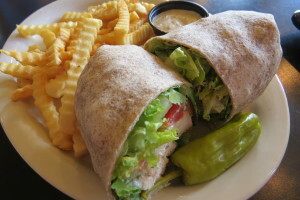 A huge tortilla, filled with fresh cooked and seasoned chicken, lettuce, tomato, olives, feta cheese, cucumbers, pepperoncini, and a light vinaigrette to keep things moist. Along with a side of fries–wow, what a grand mid-day meal for under $10.00! As tempting as it was to ‘wrap up my wrap meal’ with one of their home made parlor milk shakes, I resisted the urge, and instead carried out a menu to ponder over for future visits. And there will be many more visits. They brew fabulous coffee, offer free WiFi, make a mean Bloody Mary from what I could see, and are open 7 days a week, from at least 8 am until 9 pm. Not bad for a small town. Yes, I don’t just give this place a thumbs up…..I give it two thumbs and 8 fingers up! High TEN!Next time you find yourself driving through Walker MN, be sure to stop at The Village Square! You can read about all kinds of products, places and services I’ve found to be exceptionally great, or exceptionally not great under the “Whats New” blog category–I look forward to your comments! And please feel free to share this post with others that would find value in learning more.